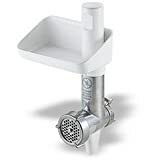 BOSCH MUZ-7-FW1 Mincer Attachment Stainless Steel Meat/Spice Grinder , selling for $199.99 brand new. Manufactured by BOSCH. There are 1 units left brand new. This BOSCH Mincer is safety filler shaft and screw conveyor made from high quality light metal stainless steal cutting blade and 4.5mm/0.18in perforated disc.